Benthic Macroinvertebrate Bioassessment Studies | ECORP Consulting, Inc.
ECORP ecologists conduct benthic macroinvertebrate (BMI) bioassessments relative to potential habitat impact assessment and community structure impairment resulting from altered stream flows and sediment deposition (e.g., downstream releases from dams, diversions, and hydroelectric power facilities). 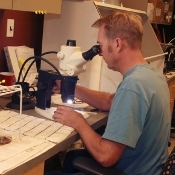 Our aquatic invertebrate laboratories are located in Rocklin and Santa Ana to provide statewide services. We are approved by California Department of Fish and Wildlife (CDFW) to perform Southwest Association of Freshwater Invertebrate Taxonomists(SAFIT) protocols and Surface Water Ambient Monitoring Program (SWAMP). Our staff are members of the Southern California Association Marine Invertebrate Taxonomists (SCAMIT).